Three months… it sounds like it’s very long time but when you actually live through it you feel like there isn’t just enough time in the world to do everything you want, especially when that thing you want to do is watching anime and indulge yourself in otaku lifestyle. Even though university left me with near 4 months of holiday I ended up being too busy with various events during summer to properly indulge myself in anime, but at the same time I also think this season was one of the most lukewarm season in a long time for me so I guess I didn’t miss much at all. There were many shows that made me curious such as Mob Psycho 100, but for some reason and another I wasn’t able to get to that show. I mean, I still need to watch Re:Zero that I promised to marathon when It finish, then again it could be that I’m mostly interested in Slice of Life shows nowadays. Oh well, let’s see what happens. On the subject of anime and such, it seems like two of the most prominent Shounen Jump manga Bleach and Nisekoi has finally ended… Wow I thought I would never say that in my life time, yes Bleach has ENDED! What gives? Now we just wait for One piece to finish… in probably 40 years’ time with Fairy Tail ending just before then. Oh course I’m exaggerating a bit but it was real shocker that now only 1 out of the Big Three remains; and now we wait patiently for even that to finish. 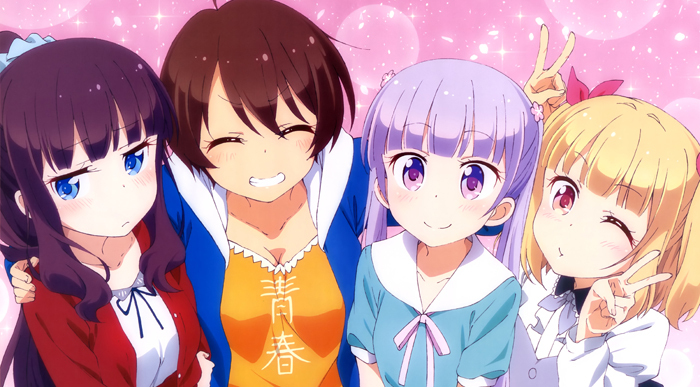 Author daniel YangPosted on September 9, 2016 March 29, 2017 Categories OpinionTags Crunchyroll, Daniel Yang, funimation, merger, partnership1 Comment on FUNimation X Crunchyroll best ship ever?! FunimationNow, will it keep me subscribed? 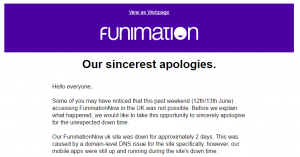 EDIT 17/06/2016: It seems like if nothing else, Funimation’s customer service and PR is quite great. 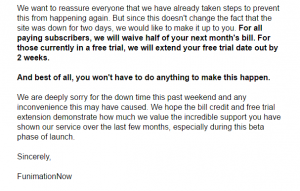 People have been receiving emails about their reduced fee for next month subscription for current subscribers due to disruption in their service last weekend. Great job on that, credits where credits due. 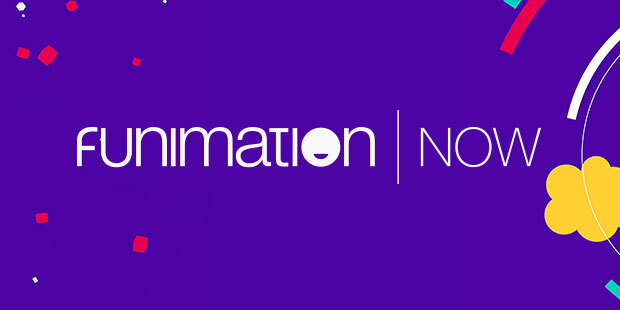 If people haven’t heard of them, Funimation is one of biggest anime licensing/broadcasting company in western world. If you are a fan of dubbed anime, the chances are that dub has been done by Funimation. They also license their show in subs and make them available in DVD and Blu-ray (if I remember correctly.) It is also broadcaster of one of my guilty pleasure Highschool DxD in western world (although I believe they are censored during broadcast.) But only problem they had was that they were only available in American continent, and as anime watcher across Atlantic ocean, only way I could watch shows that have been licensed by Funimation has been either hoping other distributors such as Crunchyroll and Daisuki will simulcast them, or watching videos that have been done by the fan sub groups. Author daniel YangPosted on June 13, 2016 March 29, 2017 Categories OpinionTags Crunchyroll, FunimationNow, Premium1 Comment on FunimationNow, will it keep me subscribed?